EVERY BRILLIANT THING, by English writer, Duncan Macmillian, with the original actor/performer, Jonny Donahue, in the Upstairs Theatre, Belvoir St, 13th March - 31st March. 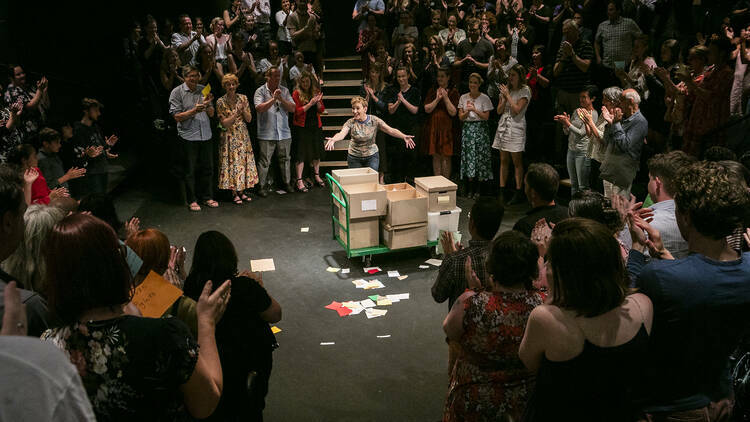 EVERY BRILLIANT THING, is a one person play - at Belvoir it is played by Kate Mulvany; on its Riverside season, which follows, it will be played by Steve Rodgers. So a gender fluid role. At the age of seven our actor is told that her/his mother is in hospital. Concerned, she is told by her dad that 'mum' has found life difficult to experience. So, in an act of loving support, our little girl begins a list of Every Beautiful Things, for her mum: 'Ice cream', is number one on the list. As the play proceeds, the list grows in the face of her mum's life-long depression and tendencies towards suicide. ...Whether it be first hand or through a loved one or friend is a recognisable part of being alive and human. Yet we rarely treat it as such a common occurrence. We give our failing bodies far more press than we give our fragile minds. 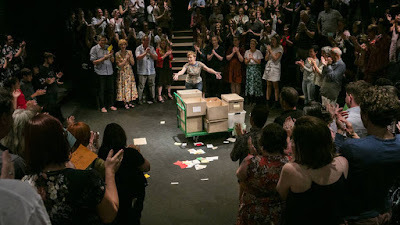 The Stage Design at the Belvoir, by Isabel Hudson, is built to place the audience in a theatre-in-the-round mode, with the Lighting (Amelia Lever-Davidson) on, for most of the performance, as some of the audience have been given cards that, on cue, from the actor, are read as part of the action. A couple of audience members, also, get to 'improvise' with the actor as characters (dad, boy friend/husband, veterinarian etc). It is a very naturalistic, 'folksy' atmospheric mode. We meet Ms Mulvany on the steps on the way into the theatre - we all feel special and personalised - disengaging us from the usual actor/audience role-play. EVERY BRILLIANT THING, is a 'worthy' piece of work and does give, depending on the depth of your own personal experience of the subject matter, I imagine, salve and needful comfort in the recognition of the shared journey we are taken on. On the other hand at almost 85 minutes running time on opening night - it was signalled in the foyer to be only 60 minutes long - the text could become 'cute' and even, at extreme, 'mawkish' - that list of Every Brilliant Thing got to be quite 'stretched' and 'long-winded'. That became my response mode in my growing resistance to the night, I'm afraid. There were many, many, many deeply moved audience and I was much reflective of that. One of my problems during the night was the highly contrived efforts by Co-Directors Kate Champion and Steve Rodgers to take us into a Belvoir, community, 'folksy' relationship - we all saw each other and felt we were all 'bonded' by this naked audience relationship, charming, warm, friendly, enabled, to feel together the 'actor's' experience over her life with her family. It was disconcerting, for me, when Ms Mulvany, in 'difficult' moments of the character's journey would drop into contemplative 'indicating', demonstrating', of 'telling' us, by 'showing' us, the pain of it all - twitches, frowns. turn-down of mouth - giving us something to LOOK at instead of to 'read' and endow from our lives with her. The choices became patently 'theatrical' and counter to the production construct. I jumped out of the production - and looked at an actor at work instead of being embedded with a fellow sufferer. Why Ms Champion (who began her career as a choreographer) and even more surprising to me, why Mr Rodgers ( who is one of Australia's great 'naturalistic virtuosos) had not advised, Directed, Ms Mulvany just to do 'the famous "GARBO NOTHING' - the last moments of the QUEEN CHRISTINA , 1933 movie - be simple, so that we, the audience, who were 'travelling' with her could imagine and own our own pain to endow, share the moment, so that we could experience the personal 'BEING" with her (each individual alone, together with her), I don't know. Mind you, Ms Mulvany, is so greatly loved and appreciated by her audience, that on Opening Night, when she made her real entrance to begin the play in the playing area, they gave her an, almost, standing ovation - the poor actor had hardly begun, and yet had earned this reception. As an actor she had hardly any more steps on her ladder of technique to need to win us over - we were already at her feet, and most of us believe(d) she could do no wrong. EVERY BRILLIANT THING. Personal response/recognition will be the decider to your satisfaction.